Gundam Exia, commencing armed intervention! Joining the SD EX-Standard series is a revitalization of the main Gundam from the Gundam 00 TV series. The EX-Standard series has strong proportions for the limbs which allows for tons of articulation, and also cross compatibility with HG kits first seen in the SD Build Fighters models. 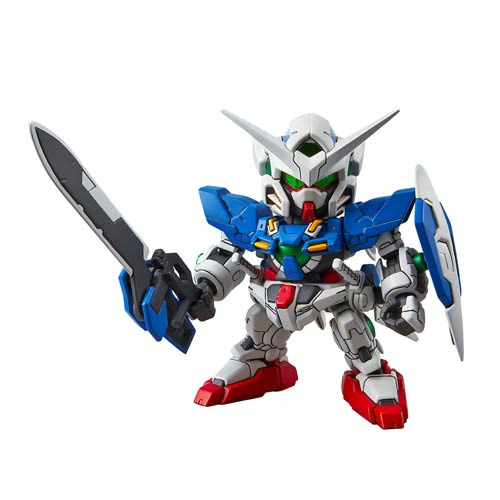 Exia features its iconic GN Sword, GN Blades, shield, and beam saber! Comes with 5 runners, a sticker sheet, and an instruction manual. Measures approximately 3-inches tall when complete. Ages 15 and up.